Manhattan District Attorney Cyrus R. Vance, Jr., the U.S. Secret Service, the U.S. Postal Inspection Service (“USPIS”), and U.S. Homeland Security Investigations (“HSI”) today announced the indictment of CHESTER ANDERSON, 44, and co-conspirators JARRETTE CODD, 41, and RONALD MACCARTY, 51, for operating storefronts on the dark web that sold and shipped hundreds of thousands of counterfeit Xanax tablets and other controlled substances to buyers in 43 states, and laundering $2.3 million in cryptocurrency by using preloaded debit cards and withdrawing cash at ATMs in Manhattan and New Jersey. Following a series of undercover purchases made in cryptocurrency by Manhattan DA investigators, investigators executing court-authorized search warrants on the defendants’ New Jersey properties and vehicles seized the largest quantity of pills in New Jersey State history, including approximately 420,000 to 620,000 alprazolam tablets, as well as approximately 500 glassines of fentanyl-laced heroin and quantities of methamphetamine, ketamine, gamma hydroxybutyric acid (GHB), and more. Investigators also recovered four pill presses and two industrial mixers, among other drug manufacturing items, and thousands of dollars’ worth of cryptocurrency. 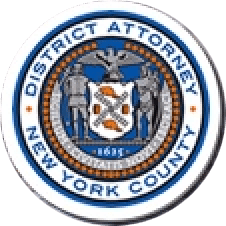 The defendants are charged in a New York State Supreme Court indictment with Conspiracy in the Fourth and Fifth Degrees, as well as Money Laundering in the First Degree. ANDERSON is additionally charged with multiple counts of Criminal Sale of a Controlled Substance in the Fourth and Fifth Degrees, and Identity Theft in the First Degree. The Middlesex County Prosecutor’s Office is handling the prosecution of the items seized in New Jersey. According to the indictment and documents filed in court, ANDERSON operated two dark web storefronts, using the screenname “sinmed,” to sell alprazolam and other controlled substances. CODD and MACCARTY assisted with manufacturing and equipment procurement. Over the course of the conspiracy, undercover Manhattan D.A. investigators purchased approximately 10,000 alprazolam tablets, in addition to ketamine and GHB, from the sinmed storefronts. Additionally, the Manhattan D.A.’s Cybercrime and Identity Theft Bureau identified more than 1,000 packages that were shipped by the defendants from New Jersey to locations across the country, and seized an additional 8,000 tablets by intercepting several of the packages. Nearly all of the packages had return addresses that falsely identified the sender as a Manhattan business, including multiple Manhattan law firms and a real estate agency. ANDERSON and MACCARTY created a shell company, Next Level Research and Development, to purchase more than 1,000 kilograms of microcrystalline cellulose, the primary ingredient used to manufacture pharmaceutical tablets. They also used MACCARTY’s cellphone repair store, The Wireless Spot, to purchase a pill press, a powder mixer, and “punch dies” used to imprint “Xanax” labels on alprazolam pills. The defendants laundered more than $2.3 million in proceeds by using the cryptocurrency they received as payment to load pre-paid debit cards, and collectively withdrew more than $1 million from ATMs in Manhattan and New Jersey. District Attorney Vance thanked the New Jersey State Police; the Middlesex County Prosecutor’s Office, in particular Assistant Prosecutor Peter Nastasi; Lt. Jeff Russo of the South Brunswick Township Police; David Roesner of the U.S. Secret Service, and Michal Lawshe of the USPIS.